Zip på tværs af Islands næststørste islås med snescootere og besøg en ishule på en 8-timers Langjökull gletsjertur fra Reykjavik. Kør en snescooter over isen mod en gletscherhule, der beundrer udsigten over snefelt og toppe. Derefter ned i hulen til fods for at se den blå is inde i gletscheren før snescootere tilbage. Returtransport, med central Rekyjavik hotel afhentning og drop-off inkluderet. Efter tidlig morgen afhentning fra dit hotel i centrum af Reykjavik eller rejse med en komfortabel, luftkonditioneret superbil - en stor 4x4, der er specielt tilpasset til at køre på isbjerg - til snescooters basestation på Langjökull, Islands næststørste iskappe. Ved ankomsten skal du nyde udsigten over den glitrende gletscher og blive vist til din moderne snescooter. Så lyt til en sikkerheds briefing, og giv det medfølgende snescootere gear, herunder en termisk coverall, balaclava, hjelm og handsker. Få instruktioner om at betjene dit køretøj, og når du er klar, skal du sætte dig i en lille gruppe på seks rejsende eller færre, ledet af en certificeret gletsjerdirektør. Krydstogter over gletscheren, og efterhånden som du får tillid, skal du åbne gashåndtaget og afhente hastigheden. Zip over isen, og nyd i den vidtrækkende udsigt over de omkringliggende snefelter og bjerge. Efter ca. 30 minutter på din snescooter, ankomme til ishallen og gå til indgangen. Derefter ned i dybet for at beundre den blå is. Lær om gletsjers dannelse og hvordan islagene danner sit hjerte og tag billeder af den surrealistiske, iskolde verden omkring dig. Efter ca. 15 minutter at udforske hulen, kom du igen på gletscheren og hopper tilbage på din snescooter. Derefter drejes motoren og nyder tilbagevenden 30 minutters kørsel tilbage over isen til basestationen. Din helgedagstur afsluttes med en drop-off tilbage på din bolig i det centrale Reykjavik. We had a good drive up to Gullfoss waterfall where we then transferred to a superjeep. Now that was an experience in itself - bit of off-roading, great fun and felt well safe with James our guide at the helm. Upon reaching the snowmobile base, we were made very welcomed by the crew. They fitted us out with our gear and then gave us an overview as to how to drive the snowmobile. After also going through the safety rules, off we went - well WOW, what an experience from the very start. Exhilarating is an understatement, It probably took us about 30 minutes to get to the ice cave, but it wasn't long enough. Then the ice cave, not as big as I'd expected but quite spectacular - our guide was very knowledgeable and he was more than happy for us to spend as long as we wanted in it. My daughter and I had a lot of fun. This was our first time snowmobiling. Our guide Mardis was professional and fun. She took good care of everyone. Arctic Adventure provided us all the gear for the trip. Highly recommend! Amazing experience, can not recommend enough. Our guide was brilliant, so knowledgeable and funny. A must do! DEFINATELY THE BEST DAY WE SPENT IN ICELAND!!!! 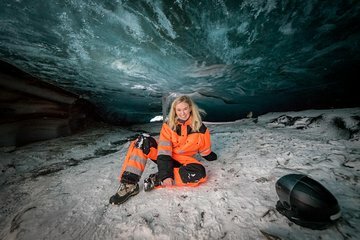 WONDERFUL TOUR GUIDES, PERFECT AMOUNT OF TIME ON SNOWMOBILES, AMAZING SIGHTS TO SEE DOWN IN THE ICE CAVE SHOULD HAD BEEN SUPPLIES ICE KLEETS FOR BOOTS AND GEAR THAT KEPT ME VERY WARM!!! A DAY WE WILL ALWAYS REMEMBER AND A MUST DO FOR ANYONE GOING TO ICELAND!!!! WELL WORTH THE MONEY! This trip was so much fun, the highlight of the entire week we spent in Iceland. All of our tours with Arctic Adventures were so smooth and lots of fun, pick up was easy, drop off was easy they were always right on time. For this tour our driver was a young guy, I wish I remembered his name, he had short blonde hair, no facial hair, he was a blast! We went off roading up the glacier then snowmobiling the rest of the way. Highly recommend this tour! This was a brilliant experience. Our host, 'Eagle' was excellent and made sure we were all well looked after. out guide was absolutely amazing!!! he was funny, helpful and adorable!! Such an amazing experience! 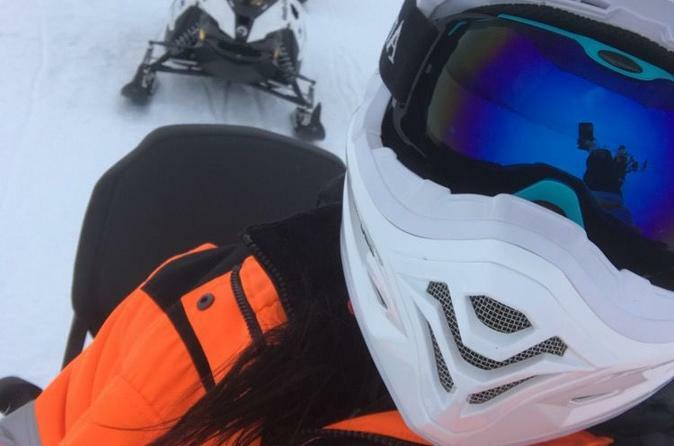 For a novice, driving the snowmobile is more hard work than fun. Going up into the high country on the glacier is very memorable. The ice cave was not a stand up and walk through experience. forever grateful we booked thru this company and our tour guide was very nice and so was our Mercedes van was very comfortable.